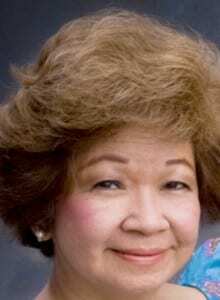 Dr. Lillian Gonzalez Pardo was the first Asian American President of AMWA in 1991-1992. She followed an equally historic year after the first African American president of AMWA, Dr. Roselyn Payne Epps in 1990-1991. As she rose through the ranks in AMWA, she valued all those years that she considered her presidency a highlight of her professional life. She traveled extensively during her tenure in AMWA representing the organization at the Pan-American Medical Women’s Association meeting in Guatemala, the Global Forum for Women in Dublin, Ireland and even appeared before a congressional committee hearing during the elder Bush presidency to protect free speech in Title IX clinics. Dr. Pardo was born and raised in Manila, Philippines. She earned her medical degree from the University of the Philippines, came to the University of Kansas Medical Center to pursue a career in neurology, later specializing in pediatric neurology. She also earned a degree in Masters In Health Care Administration at the University of Kansas while a full time faculty. She rose through the ranks in academia, culminating in a Clinical Professor rank. Upon her retirement from the University in 2006, she was awarded Emeritus Professorship honor in Neurology and Pediatrics. For the past ten years, Dr. Pardo has participated in volunteer medical mission work to different regions in the Philippines. She leads a professional group of forty physicians, nurses and friends, primarily based in Kansas City for this annual activity. Other volunteer work involves cultural programs of the Filipino Association in Greater Kansas City where she serves as the Executive Director of their Dance Troupe-celebrating its 40th year in 2012. She is also a member of Zonta International, a service organization of business and executive women whose goal is to improve the status of women worldwide. As a Board member of the United Nations Association of Greater Kansas City, she is also involved in local projects to spread the work on the United Nation’s activities globally, such as the UNICEF and the World Food Program among others. Married to a psychiatrist since 1964, she says she has good mental health coverage. They dote on five grandchildren, who all live in California, so they visit the west coast often for significant milestones of the children’s lives.